Please watch the YouTube video at the end of this article to see the treatment outlined on this page being used on a Red fox on Long Island- watch his transformation from sick back to healthy again! I often get calls and e-mails from people who have a Red fox around that is acting lethargic or unfearful of humans. They will stay close to houses and will eat under the bird feeders, seek refuge under decks and often lay in the hay in barns. A scruffy, thin appearance usually indicates that the fox has Sarcoptic mange. Sarcoptic mange is the name for the skin disease caused by infection with the Sarcoptes scabei mite. The mites are microscopic and can’t be seen by the naked eye. Female Sarcoptes mites burrow under the skin and leave a trail of eggs behind. This burrowing creates an inflammatory response in the skin similar to an allergic reaction. The motion of the mite in and on the skin is extremely itchy, as is the hatching of the eggs. This creates a further allergic reaction and more itching, loss of sleep and reduced immune response. Loss of fur, scaly skin and a general unthrifty appearance is characteristic of a Sarcoptic mange infestation. The condition worsens as a skin infection sets in. The foxes immune system is even more compromised and internal parasites (tape, hook and roundworms) begin to take over and absorb any nutrients that fox may find. 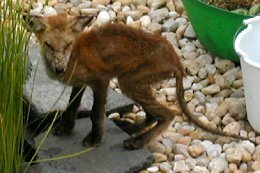 Mangy foxes are usually starving in the late stages. These foxes are not a threat to people, dogs, cats, etc. They are close to people and buildings because there may be easy food such as cat or dog food left out in dishes, bird seed, garbage, insects, worms, roadkill and a mouse or two. They are also losing their ability to thermoregulate and need protection from wind, shade, sun, whatever the present need of the body is. Mangy foxes (and coyotes) often seek out a pile of hay to lay in. Hay seems to relieve the itchiness and provide a source of comfort. Sarcoptic mange is treatable if the animal is treated in time before the process of organ failure begins. The drug of choice is inexpensive and easy to obtain. Although it is an “off-label use” according to the FDA, Ivermectin injection for cattle and pigs is a very effective cure for Sarcoptic mange in foxes. This injectable solution works orally and can easily be slipped into food. The ivermectin also treats a lot of the intestinal worms and any ear mites. The catch is this: it kills the mites living on the skin but doesn’t kill the eggs. These eggs will hatch and reinfect the fox, so it has to be administered many times to kill the mange mites that hatch after treatment. A less expensive injectable version of Ivermectin such as Ivermax 1 %, Agrimectin or Noromectin 1% are all readily available online and in some farm stores. I strongly recommend treating Red foxes very aggressively, giving them the Ivermectin every five days for the first three weeks. After the first three weeks, you can dose them every ten days. Be sure to treat them for at least 4-5 weeks. A daily feeding station using dry cat or dog food can be set up to facilitate the administration of tasty treats laced with ivermectin. Frozen all beef meatballs with no spices work great and when they are warmed up, are easy to inject the medication into. A spoonful of canned cat food, a hard-boiled egg, a chunk of cooked chicken or a section of hot dog can also easily be injected with the ivermectin. 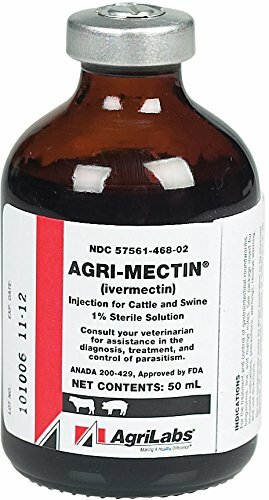 Agri-Mectin is a generic injectible ivermectin available on Amazon.com It comes in a 50 Ml bottle for roughly $32 it contains enough Ivermectin to treat hundreds of foxes, so it will be plenty! 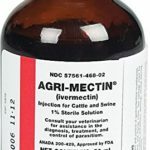 When you purchase the Agri-Mectin or any other bottle of Ivermectin, it comes with a rubber stopper that you will need a syringe to draw the liquid out. WARNING: Use ONLY the INJECTABLE Ivermectin NOT the “POUR ON”, as the agents for carrying the pour-on through the skin are highly toxic if ingested! If anyone tells you differently, they do not know what they are doing! Of course, other wildlife might get to the food before the fox does, so try to use your judgment and administer it the best way that will target only the fox. Placing a leaf or a little grass over the baited food will lower the risk of it being seen and eaten by crows. Using hard-boiled eggs will decrease the chances of the food being eaten by cats. Ivermectin is a pretty safe drug and won’t harm most wildlife. Some breeds of dogs can be very sensitive to it, particularly the collie family and Australian shepherds. Don’t use ivermectin if there is a chance a collie breed might eat the bait. Use extra caution around domestic animals. They use Ivermectin in third world countries to treat different things, such as scabies in humans. Ivermectin is also used to treat dogs for mange, and it is also a good wormer for many animals. Select topical products Advantage Multi and Revolution can be obtained from your veterinarian and used to help protect your domestic dogs from picking up mange in the grass surrounding your property. I have found Advantage Multi and Revolution to be very effective preventatives for mange in dogs, but very ineffective cures for mange, unless applied every two weeks during the month for at least 6 weeks. I apply Advantage Multi or Revolution to all my foxes just before they are released back to the wild as a preventative measure for them. Can people get mange? You bet, but it won’t live and reproduce on your skin. It will give you one heck of an itchy red allergic reaction if you are sensitive to mange mites though. 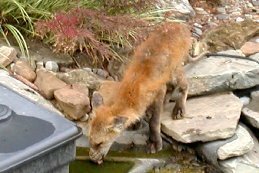 Please watch the beautiful short video on Youtube made by a gentleman on Long Island who was able to videotape his treatment of a Red fox with mange in his back yard. He used the treatment outlined above.